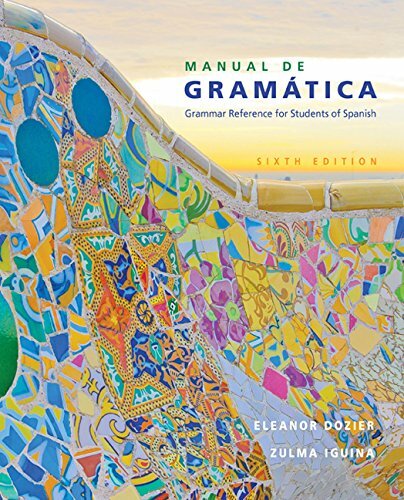 1305658221 -Thanks to its flexibility, simplicity, and range, MANUAL DE GRAMÁTICA, 6th Edition, is the most accessible grammar reference for intermediate and advanced Spanish students. It combines clear, easy-to-use charts with detailed grammar presentations in English, and offers valuable conceptual distinctions between Spanish and English. The text follows a logical progression of topics, from parts of speech to verb tenses to the finer points of lexical variation. Facilitating independent study, the online answer key provides students an opportunity to self-correct in practice. The text covers all major grammatical rules of Spanish and offers real-world applications of all grammar points, making it an invaluable reference tool for intermediate and advanced literature and language courses.